Think back to your first high school job: not cutting grass for your parents or taking care of your neighbor's dog; your first real job, with paychecks, taxes, and a consistent schedule. What was that like? If you were like most American teens, you might remember babysitting, scooping ice cream, or washing dishes. They aren't the most rewarding jobs or the most entertaining. But I can't say the same about mine. I knew that my job was going to be different from the beginning. As a 17-year-old, you don't expect much out of summer work, just something to put gas in your beat-up car really. Yet when I walked into WMSI headquarters for the first time, my eyes lit up. In that little office space on Park Avenue, technology was everywhere. Robots of every function and design crowded the shelves, 3D printers hummed away on tables, and busy workers in matching blue t-shirts lined the room. Suddenly my misconceptions about what my line of work was going to be were thrown out the window, and I knew that this was how I wanted to spend the next few months. Now it is my second year with WMSI, and on a cool July morning at 7:15am, my alarm goes off as usual. After hopping in the shower and throwing on my own (now slightly worn out) blue WMSI t-shirt, I grab a bagel on my way out the door. When I stroll into our basement classroom, my coworkers (many of them my age) are hard at work. July is the heart of summer camp season, and we are prepared for an especially active day today. The usual morning routine is put in motion with all hands on deck. I help set up our activities tent on the lawn, while laptops, the projector, and other miscellaneous electronics are brought over from the office. As 9:00 rolls around, excited campers begin to tromp in, and we get down to business right off the bat. The kids happily doodle or fold paper airplanes around me, and soon the classroom is filled with different aircraft whizzing past my ears. By the time the last camper has arrived and settled in, we are ready to move on to our first daily activity. The computer program Scratch is a favorite for this, and within the next few minutes everyone is engulfed in their own imaginative stories. Scratch can be difficult at times, and there are always many requests to be dealt with. This makes me a wish granter of sorts, and for that hour or so before snack time, I am tasked with making all sorts of crazy, beautiful ideas come to life. My favorite request comes from a young boy who wants to turn a fortune cookie into a Boeing 737 and then fly away. The look on his face when it finally works is priceless. At the conclusion of our snack break and a whirlwind game of sharks and minnows, we all head back inside to begin our next activity, which is new this year: all-terrain robots. The campers are broken into pairs to begin work while I design a course for them. The final product is complete with a pump track, a gravel pit, and a steeply curved wall at the end (à la American Ninja Warrior). Construction and brainstorming are in many ways just as big a part of my job as actual instruction, and in this instance, the work pays off and everyone is having a blast. Upon finishing lunch and our afternoon game, the kids are once again herded inside for the final activity of the day. This time we are making marble runs--an activity also new this year--out of various crafting supplies. The kids use their persistent imaginations without fail, and before I know it, another object whizzes past my ear; a marble of course. I look up to find a massive structure suspended from the ceiling with string, and chuckle to myself, "Why not?". Before we know it, the day has gone by, and the campers all tromp back out the door to waiting parents, leaving us to try and make the classroom look like it wasn't just hit by a Category 5 hurricane. But, much to my surprise as always, we manage to sweep, sort, and put away everything in due time. From there all the counselors head outside to debrief how the day went: favorite parts, possible changes, and even best funny quotes are shared. As I stroll back to my car, I think of how lucky I am not to have a "normal teenage job". Instead of sitting behind a counter or at a sink, I get to share my love of technology and all of its benefits with others. And by teaching children these useful skills, I am giving back to my community as well; raising a future generation of independent, creative thinkers from my area. Whenever someone asks me what I do for work, I usually laugh and state, "Oh I play with Legos," but in reality what I do is more similar to what's printed on the t-shirt I wear every day. I invent, design, make, craft, code, and most importantly, imagine. Think there’s only one or two tools at your disposal to design a fun, engaging, interactive game with your friends? Not so! 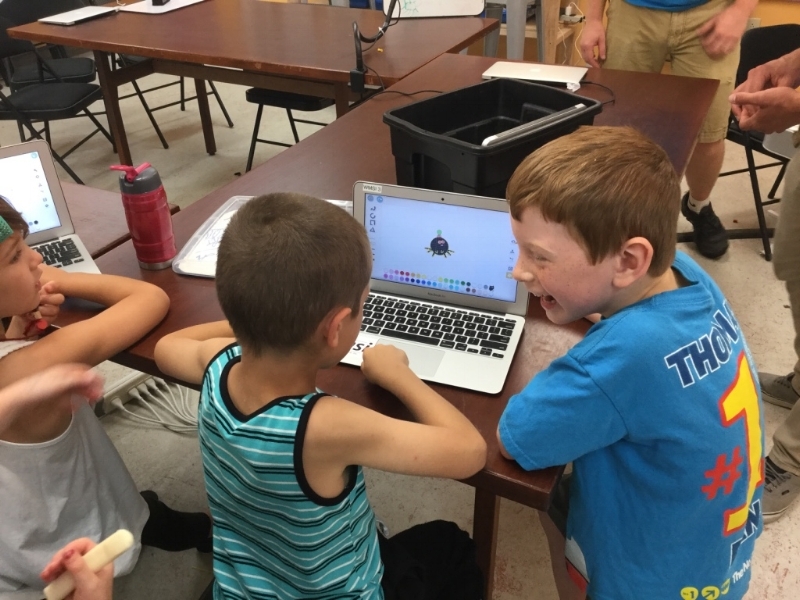 During our week of Game Design Camp in July, we demonstrated the vast array of maker tools a game designer has in their arsenal, and despite a jam-packed week of game designing, we only scratched the surface of what we can create! We started off simply with using perhaps the most powerful tool we have completely on it’s own: our minds! Crafting a story one word at a time, we rounded the circle of campers multiple times and developed characters, setting, and a plot to create our very own story! We quickly realized how we can create something from nothing, no matter what tools we may or may not have. 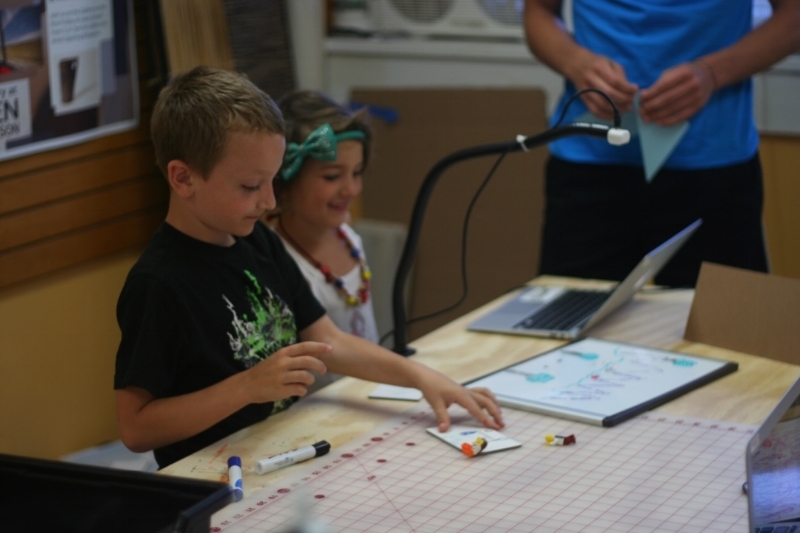 As the week progressed, we utilized more and more maker tools to design our own games: LEGO EV3 robotics-inspired tag games was a popular one, where campers used coded color sensors instead of their hands to "tag" each other. In addition, there were Minecraft games coded in Python on a Raspberry Pi, and even a catapult-launching challenge with our very own WMSI-made 3D-printed catapults! Our campers used their storytelling abilities to transform a story into their own board games. In one board game, the objective was the efficient training of sled dogs, and certain moves on the board garnered the player additional supplies and training techniques to successfully complete this task. Even baseball was made into a fun board game version, where a spinner determined the result of a player's at-bat turn. It was fun watching the campers take their passions and mold them into an engaging, multiplayer board game! One of my personal highlights of Game Design Camp this year was our final activity of the week: the construction of a maze out of cardboard and classroom materials (chairs, tables, etc.). The WMSI-spin: the maze had to be navigated with our eyes closed and with only the help of a coded EV3 LEGO MINDSTORMS ultrasonic sensor. 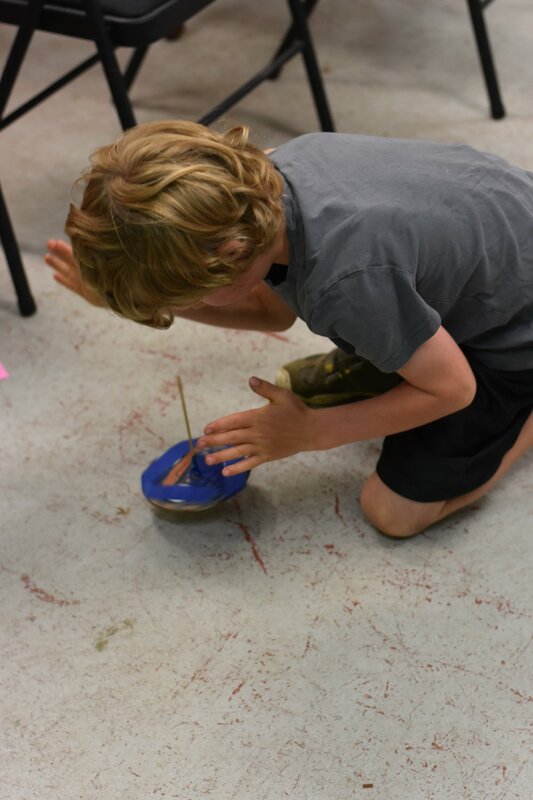 Our campers fully embraced this challenge and got to work on a wonderfully intricate and tricky maze, and then coded their sensors to detect objects in their vicinity. One by one, each camper took a turn venturing through the maze: crawling, jumping, sneaking, and tip-toeing, we quickly realized how engineers can create some pretty cool solutions to real-world problems, making the world a better place one line of code at a time! Is it time for our next Game Design camp yet? 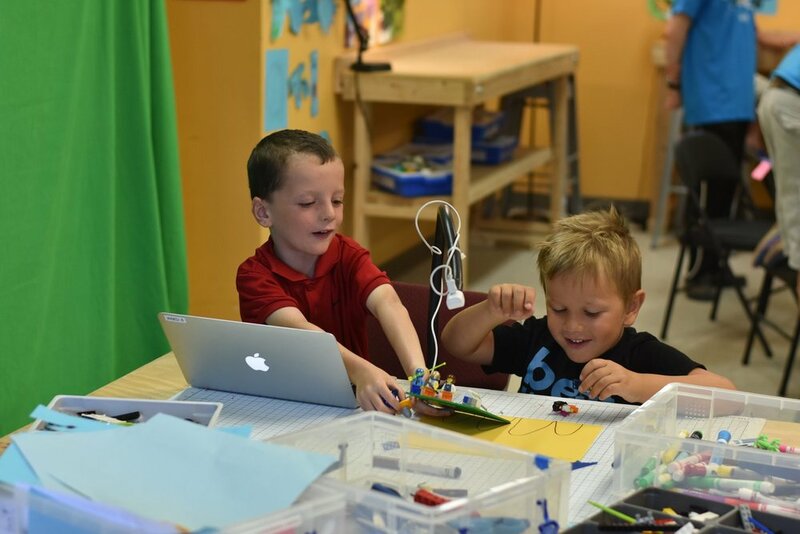 WMSI’s summer camp season kicked off this year with our young makers camp--a fun and exciting place for our younger STEM explorers to delve into their maker side! 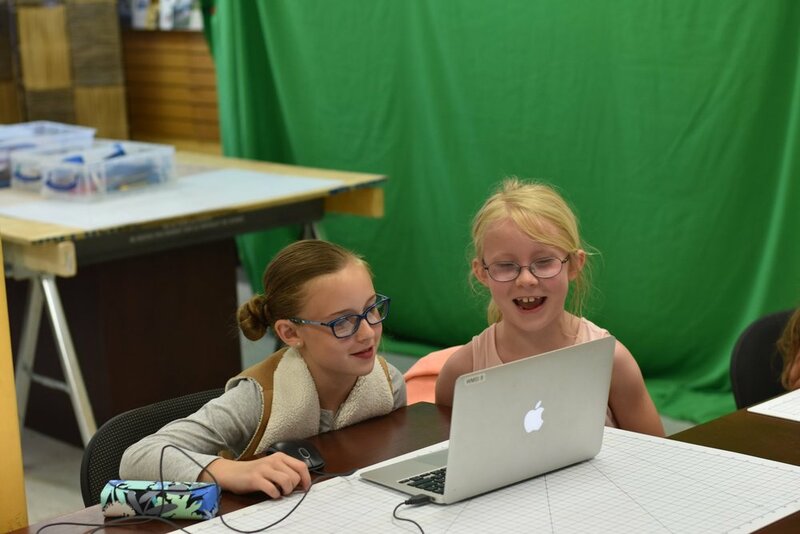 We opened the door to the possibilities of STEM with creating our very own Stop Motion Animation movies to commence our first young maker camp of the season. Our campers brought to life laser-cut cardboard cut-outs, legos, and other materials with their videos, all the while working with their partners and brainstorming exciting ideas. 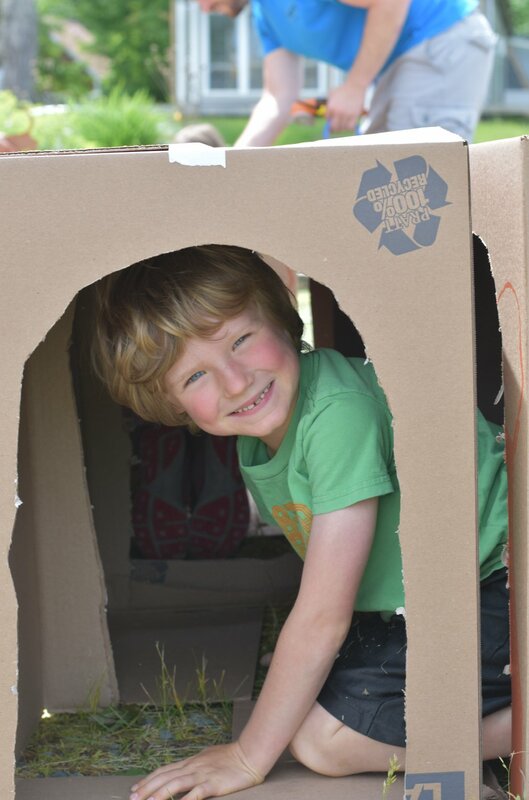 The feature of Day 3, and the finale of our first young maker camp of the season, was another all-new experience for WMSI camps: construct a box fort! Early that morning, instructors assembled a bunch of boxes for our young makers to choose from for the purposes of constructing their portion of the fort. That afternoon, they were all given materials and a section of the fort to design out on our lawn. We liked to think of that hour as “managed and productive chaos”, as all of our campers went to work with our instructors to produce a truly fun and sizable structure, complete with doors and windows, tunnels, rooms, a lookout tower, a periscope, LED lighting, and more! It was an hour of extremely enjoyable work, and we can’t wait to do this one again!! 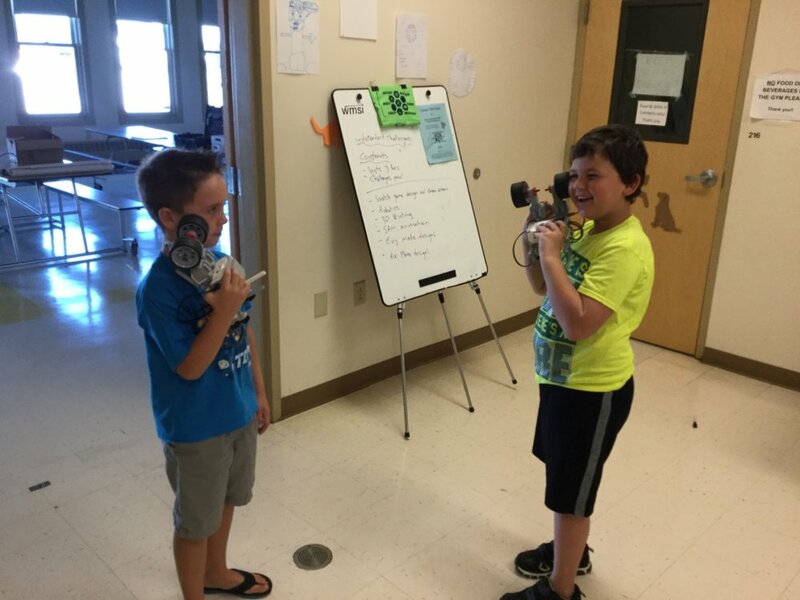 This summer we shook things up a bit and held a 2-day Young Maker Camp opportunity a few weeks later, with additional STEM activities and challenges! That included the construction of wigglebots, a WMSI favorite, which consists of making a moving robot driven by a simple DC motor and attached gear. The motor-gear combo creates a centripetal force that allows the robot body (made from common materials such as recyclables, rubber bands, zip ties and wooden dowels) to move around. Another brand-new project we launched with this 2-day camp was rubber-band helicopter construction! Using pieces fashioned out of straws, rubber bands, paper clips, Q-tips, and some other simple materials, students all crafted their very own helicopters! We wrapped up camp with helicopter test flights, and watched in awe as they took flight! Making things fly is always fun! Our two-day coding camp was a WMSI first this summer, as we dove more into the different sorts of programming languages and platforms available for our young STEM Explorers. For Coding Camp this year, we focused on three in particular: Scratch, Python, and LEGO EV3 MINDSTORMS. From coding stories and games in Scratch to building massive structures in Minecraft with only a few lines of code, we demonstrated the exciting true power and efficiency of computer programming! WMSI utilizes Scratch for many of it’s programs, including our Mobile STEM Lab as well as most of our summer camps. Block-based coding is a wonderful way to get one’s feet wet in the world of coding, particularly those with a more visual mind that can find text-based coding a bit more daunting (I speak from experience here!). 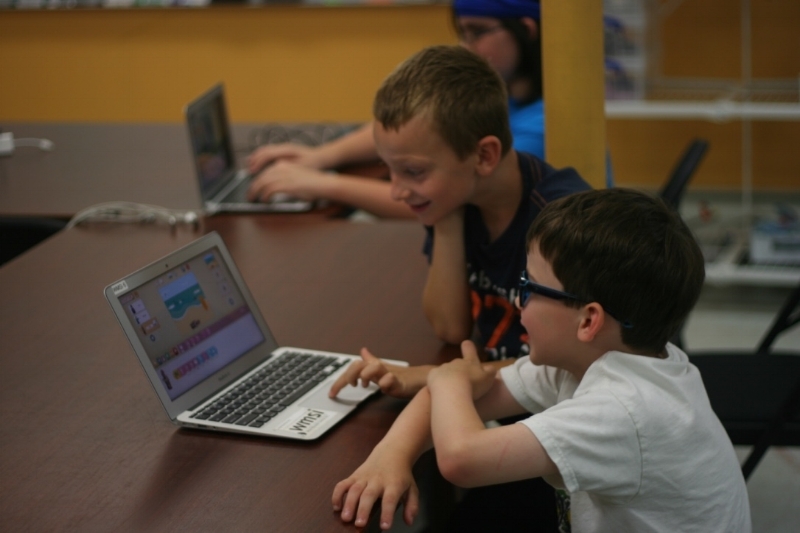 During Coding Camp, our campers used Scratch to code their very own stories. There were princesses that turned into dragons, wizards casting spells on other objects, and dueling knights too! We’d use different challenges to teach all sorts of different commands in Scratch. Loops, if/then statements, switches, etc. truly come alive and reveal their power for STEM Explorers when these commands provide the means to make magic happen on the screen before their very eyes! 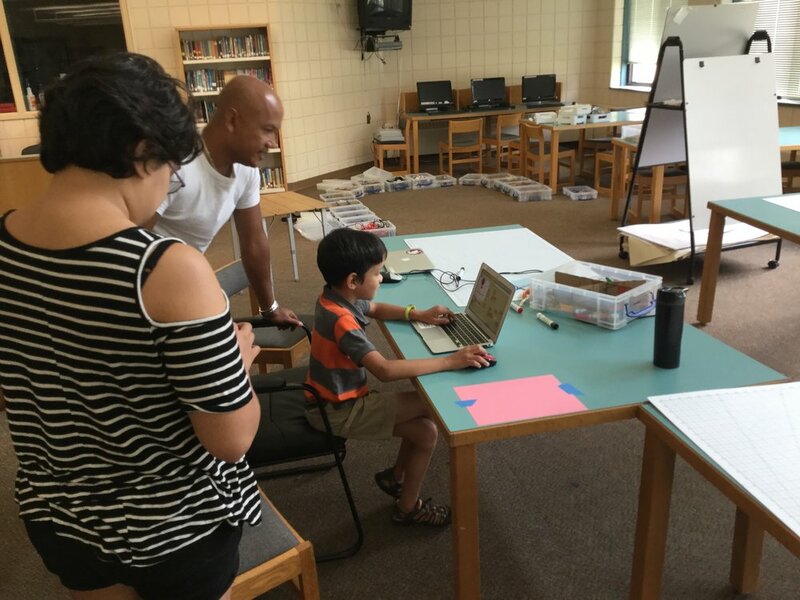 It was wonderful to see our campers’ creativity with the Scratch activities as well, as a diverse spectrum of story ideas blossomed from the same blank slate with which they all began! We also explored EV3 LEGO MINDSTORMS block-based coding, which allowed our campers to program EV3 LEGO robots to make decisions. Using touch sensors, our EV3’s played different sounds. Using color sensors, our EV3’s made sounds after detecting the programmed color. Using ultrasonic (motion) sensors, we made a fun maze of sensors through which our campers had to traverse without setting off the sensors! The true diversity of tasks one can accomplish with coding was surely demonstrated! We also used a block (no pun intended) of Coding Camp to tap into a little bit of text-based coding in Python. Though the programs were largely written by our awesome team of WMSI instructors beforehand, we empowered our STEM Explorers to tinker with the text-based code, and observe what would happen to their Minecraft structures when small changes were made to the program. From floating castles in the sky to mazes made of mirrors, we witnessed how just a few key strokes can result in a massive and intricate structure that would normally take hours to build manually! 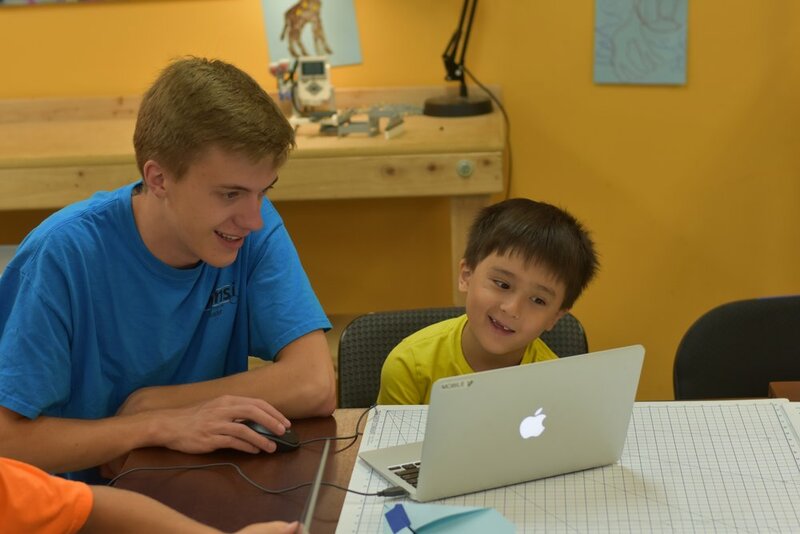 We had a lot of fun working with our STEM Explorers in Coding Camp this summer, and we’re looking forward to the possibilities for future camps! The universe of Minecraft can be a rabbit hole of sorts, but also one filled with endless worlds overflowing with endless possibilities. 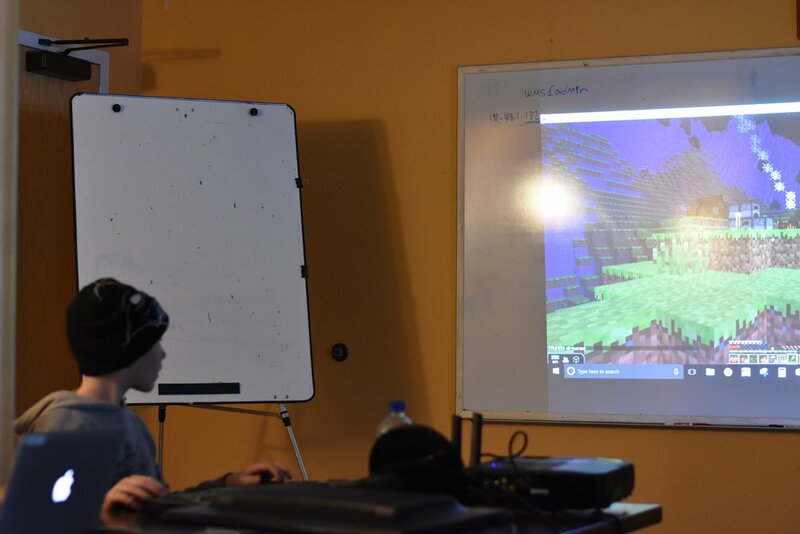 Over vacation week, WMSI used this diverse and exciting universe to bring STEM to vacationing students across New Hampshire’s north country with our two-day Minecraft Camp here in Bethlehem. After brief introductions and getting-to-know-you’s, students sat down at their respective stations and collectively entered the world of Minecraft to complete several intriguing challenges. Our world is one of limited resources, an important lesson that our STEM students learned in our first camp activity: building a house in Minecraft using only a strict set of allotted materials. Students were required to pool those resources in an effort to build the house as a team, each designing intricate rooms that all served different purposes. The resulting house displayed a remarkable diversity as each student put their own respective mark on the room they designed, yet certainly conveyed the importance of working together to ensure resources are allocated where necessary, and that everyone’s individual designs work in tandem to form a cohesive unit. We closed out Day One by forming two teams and using Makey Makey technology for each team to navigate a tricky Minecraft maze. With each member of the team in charge of navigating one specific direction within the maze, this made for some excellent team-building! Day Two of camp opened with students facing off against the camp instructors, with students attempting to navigate a Minecraft obstacle course while our instructors placed lots of tricky barriers in their way. While the instructors certainly produced a tough challenge, the students proved equal to the task! 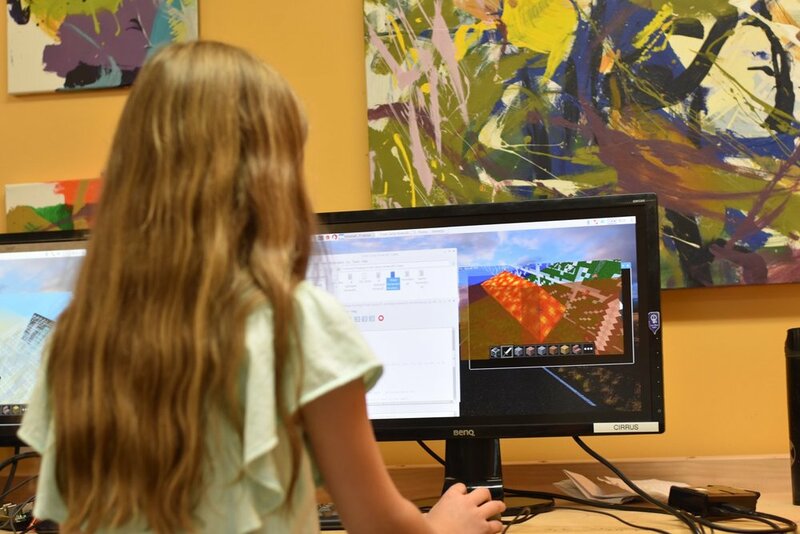 The final leg of Minecraft camp was the ultimate team challenge, with students putting on their Search-And-Rescue hats and seeking out a virtual lost hiker in a simulated MInecraft version of the White Mountains. With concepts such as conserving limited resources, navigation, surviving a remote environment, and dependence on teammates, this big ultimate task also proved successful. It was truly a wonderful sight to watch all of the students work together to find the virtual lost hiker! All in all, our Minecraft Camp was a huge success, and we’re looking forward to our diverse set of camps coming up this summer! WMSI Mobile Camps Across The North Country! WMSI's first ever mobile summer camps wrapped up last week with lots of grinning faces and awesome completed STEM projects! 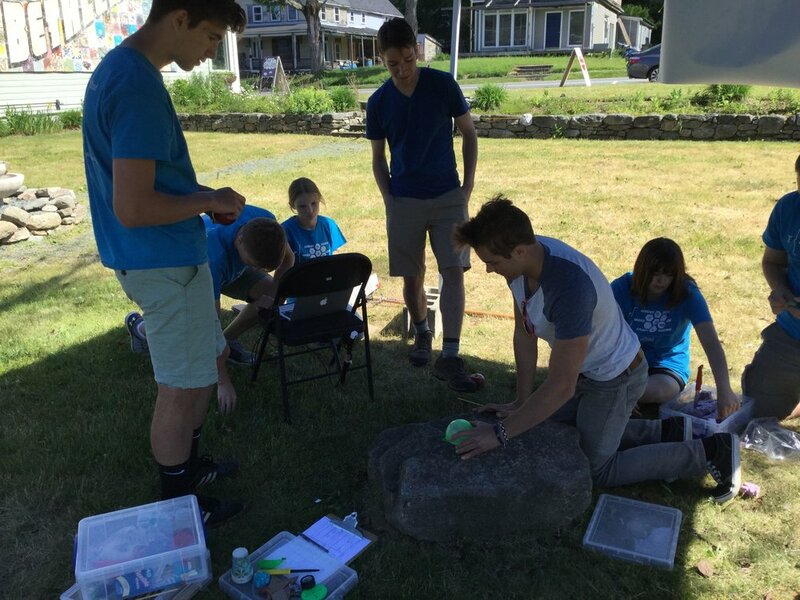 WMSI Campers in Gorham, Milan, and Lancaster have been absorbed with the fun challenge of following the design process, enjoying their mistakes rather than fearing them, and following their passions while tinkering on awesome creations. 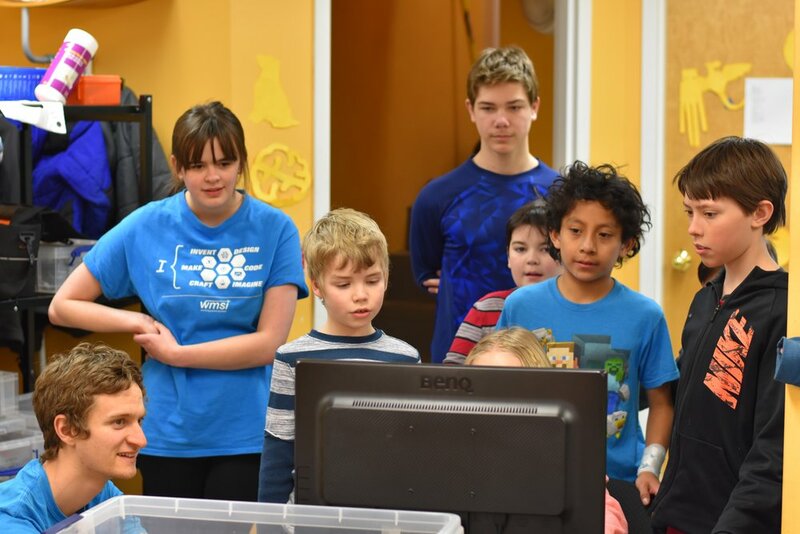 With looks of concentration and frequent giggles, WMSI Mobile Campers created everything under the sun, including animated soccer games, complicated maze codes on Python, ziplines, 3D prints, robotic dogs, and so much more! Participants in these camps started with the fun challenge of animating LEGOS using stop motion animation, a process which strings many still pictures together to making a movie. 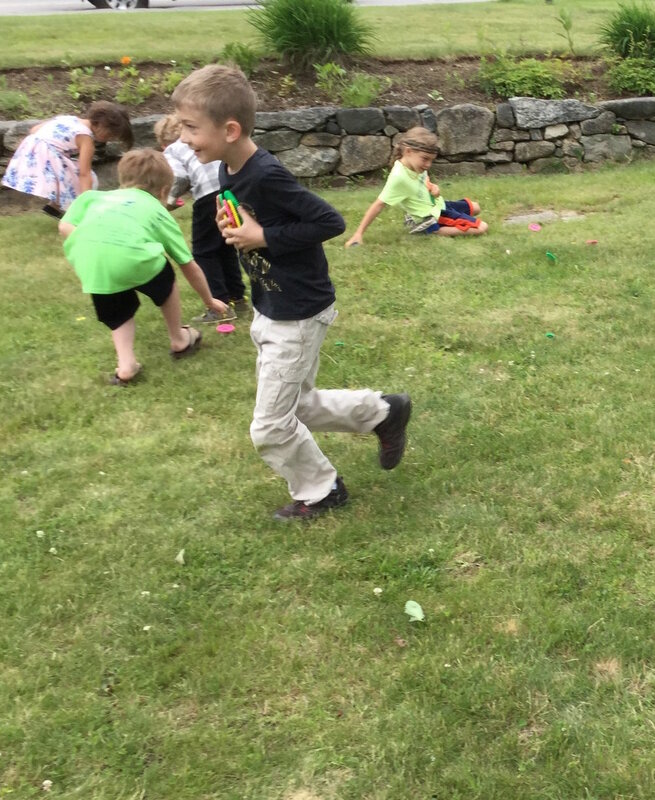 Soon, dragons were soaring and LEGO battles were raging! Some students took the challenge a step further and created movies about their passions, such as whiteboard soccer games, mountain rescues with helicopters, and space themed exploration! We also dug into aeronautical design at camp, using paper airplanes, paper helicopters, paper circles, and laser cut balsa wood planes to test what shapes fly best. There were many rubber band powered balsa wood planes that had head on collisions with our STEM van (above)! Giggles were had be all. A variation on our challenge: an ink slinger! very unique. A well designed circle drawer! 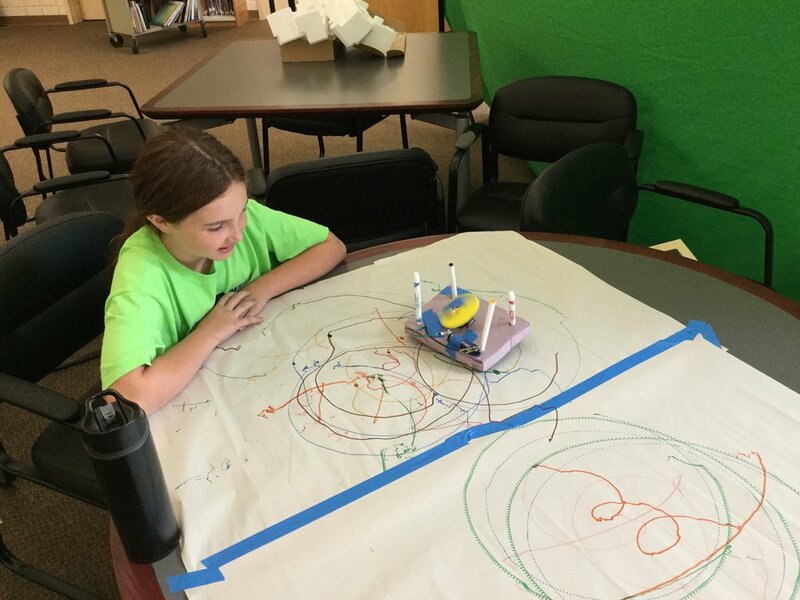 With many good STEM projects, there is often an artistic portion, whether its in designing a beautiful laptop casing (Steve Jobs was very serious about having macbooks look awesome) or creating a drawing robot (above). We tasked students with creating this drawing robot by attaching hobby motors to a base. Students then attached offset weight to a rotating gear, causing large amounts of vibration. Grins grew as marker legs skittered around on paper, creating circles, squiggles, and zig zags. The coolest part of the activity was the redesigning process. Students modified their builds by moving the motor and changing the offset weight, creating different patterns. They then created hypotheses as to why their modifications led to different results! Cool science! 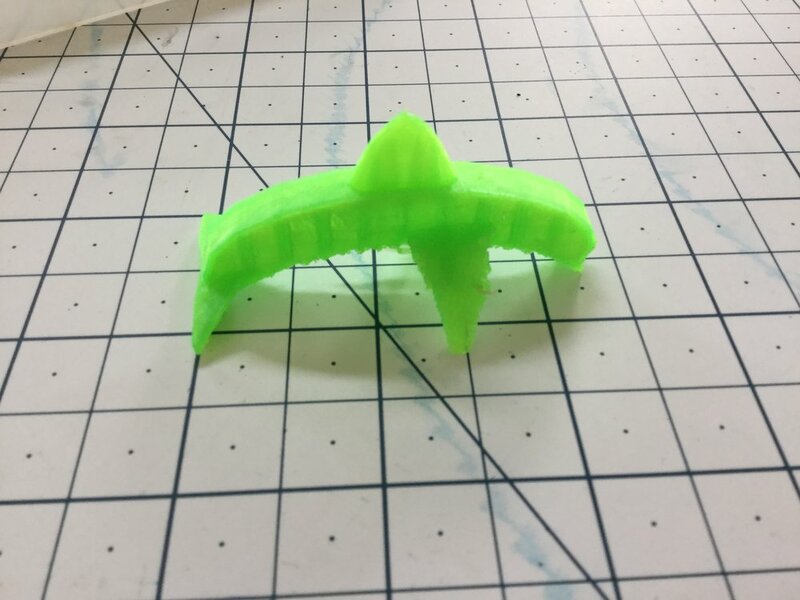 We also explored a rapid prototyping tool at STEM camp: the 3D printer! Engineers use these tools to quickly test designs they have before taking the time to create a sturdier/larger model. Students began this challenge by exploring a 3D modeling software called Tinkercad. This software allowed them to create complex objects using basic shapes and virtual carving tools. Students used the software to create several different types of necklace charms. Some students created Pokemon characters (this was a very popular choice!) while others designed natural objects like flowers! One student even designed an outline of New hampshire (above), even including local objects like arrow heads in the design! Of course, with any WMSI STEM camp, there's always excitement surrounding coding games. Knowing how to use a computer language is now a significant part of many jobs. 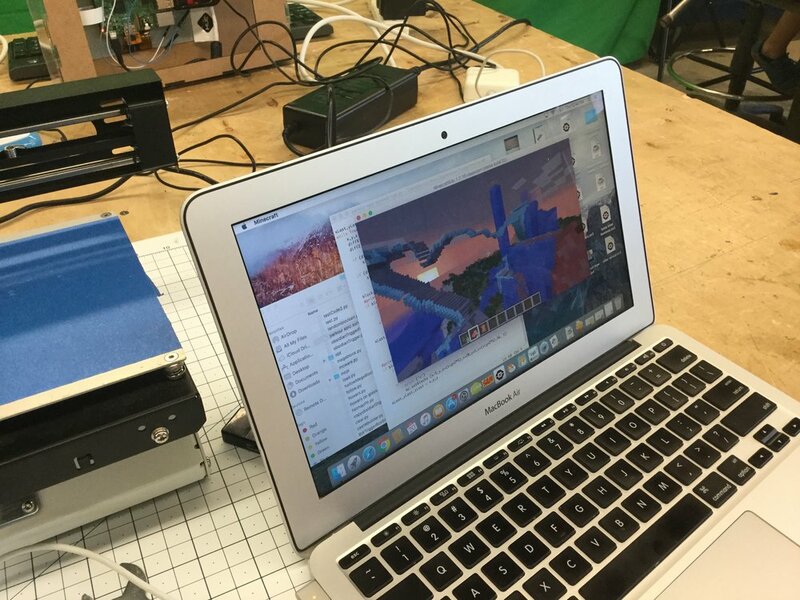 Students first started with using Python to code in Minecraft (above). Next, students used loops and conditional statements to create obstacle courses, mazes, and speed games with lots of trigger blocks and traps! One student even created a water and diamond course that had hidden TNT generating code, leading to a quick trip back to the beginning if you accidentally stepped on the trigger block! At the end of each camp, we had one final independent capstone project. This challenge had much less structure and offered a chance for students to apply what they learned during the week with their favorite STEM tool. We started with a group brain storming, discussing how to work efficiently in an independent setting. we also discussed how to frame a project in order to stay on task and finish before a deadline. Students took off with this challenge, quickly scribbling down plans onto white boards and jumping straight into the design process of ideate, build, test and re-build! All in all, our Mobile camps in Gorham, Lancaster, and Milan were great fun! We're so proud of all of these campers for their excitement and progress within STEM. We hope to see you all at another WMSI program soon! Mini Maker is finishing up today, putting a wrap on three days of wild creativity and innovation! Participant projects included 3D printer based design, hydraulics and pneumatics, Aeronautical design, Python based coding, and much more! Participants learned the ins and outs of 3D design. Then they got to watch in fascination as the printer slowly formed the charms that they dreamed up! Aeronautical design was a highlight, as students built and then added adaptations onto laser cut balsa wood planes. These light flyers are powered by rubber bands, which give the planes enough power to, in some cases, fly over 80 feet and subsequently get stuck on our roof! Participants spent lots of time making minor adjustments to the wings in an effort to create optimal flight! And of course, we also spent of a bunch of time launching, chasing, and giggling after planes as well. Another highlight of the week was our afternoon of computer science! We loaded up one of the cheapest and smallest computers in the world, the Raspberry Pi, and played Minecraft on it! Later, we used a coding language called Python to create massive skyscaper blocks in seconds, huge custom designed castles, and even random block generators that shot out mushrooms, fire, cobblestone, and water melons as you ran! a massive LEGO battle with a whiteboard background! We wrapped up the last day with an all time student favorite: stop motion animation! Students broke into pairs and took pictures of a scene that was created with LEGOs, a whiteboard, or themselves outside! Participants then made slight changes to their scenes, capturing every change with a picture. At the end, they strung each picture together and created very cool videos! There were huge rollercoaster whiteboard videos, LEGO battles, floating kids, and much more! One group (above) spent over two hours engrossed in their video, creating a LEGO coaster car that spun around a track while teleporting and getting fired out of cannons! There was also a space ship involved. We ended the camp on a high note with a game called Calvin Ball. Within a boundary, students had to make up one new rule for their game every 30 seconds or so. They got really into the game design process! We ended up with a game where students tried to tag counselors with rubber bands and counselors lightly bopped students on the head with plastic balls. If you were bopped or rubber banded, you were frozen for 5 seconds. There were also safety bases and skipping rules. Loads of chaotic fun! We ended the day with some Minecraft group challenges where every student was on the same server creating bases and protecting each other from zombies. tree houses, battle bunkers, and castles were created for safety. All in all the camp was loads of fun for the kids and WMSI staff! Looking forward to seeing you all next year!! Game Design Camp has begun with high creativity, fun, and goofiness - all the things you'd expect from a group of growing game makers! We started the week with a challenge: let's learn the elements that make a good game across multiple platforms, whether that platform be a computer game, an outdoor game, a board game, or even a cell phone app. Participants have risen to that challenge! One young designer created a paper hat throwing game with a counselor! Laughter was enjoyed by all. Humans have been using games as learning tools for thousands of years. Good games always teach something, so that, as you play, your chances of winning the game become higher. Participants used this idea to design amazing motion sensor mazes (below). Students coded these sensors to have basic artificial intelligence, which allowed them to speak certain phrases or make certain sounds if triggered. Participants used these to create obstacle courses which taught strategy, flexibility, and agility. Good games also have good story telling, often unlocked through level-based design. As you unlock each level, you are rewarded with more of the story. Participants have been working on designing level based games using various platforms, including Scratch coding, Game Star Mechanic, and even app making software like Bitsbox! Stories have involved moon colonies, dogs looking for their owners, and even dragons flying through magical kingdoms! Overall, its been a great start to the week with amazing creativity, group work, coding, laughs, and whacky games. After a brief hiatus, WMSI Workshops were up and running again last week with three days of challenges, laughs, and adventures! We kicked off vacation workshops with an interesting blend of robotics and crafts. the challenge? Build a you-sized, pet-sized, or me-sized robot using cardboard and LEGO Mindstorm robotics kits. Students went a bunch of different ways with this, building sharks, trams, ocean waves, and race cars. Meanwhile, other students took recycle art to the next level by putting markers and a motor on their favorite carton or tin can. Next, they powered up the motor, which spun around an uneven weight and caused the "squiggle bot" to zoom around, drawing all sorts of sweet designs. Participants challenged themselves in a whole different way the next day. As students filed into the WREN classroom, they were greeted with a lineup of fruits and vegetables. Their first challenge was to find conductive materials (such as a sweet potato) and make a functioning electrical piano using these materials as buttons. Giggles filled the room during this experimentation as participants set up bananas, apples, and scissors to act as piano keys. Students then took what they just learned and used that knowledge to design fully functioning game controllers! After designing a Mario controller, these students decided to hack the code and make Mario fly! A very cool Nintendo classic game controller design! Our last day came with a buzz of excitement and snippets of tech savvy conversation bouncing around. Words like "mods", "redstone", and "monster generators" were common. We've learned that there are few things more exciting in this world than playing a multiplayer game of Minecraft with 10 of your friends right beside you. Each student logged onto a laptop and had a 15 minute warm up on an obstacle based world. After that, game faces were on. The STEM challenge? You have a village at the base of a volcano. You have 25 minutes to prepare your homes before two volcanoes explode and pour lava down towards your home. The noise level rose dramatically as students zoned in and teamed up to take on this real world challenge. Some groups prepared walls. Others took apart their homes, put those parts in a chest, and hid that chest far away from town! One group even crafted and prepared a water dispenser on top of their house, hypothesizing that lava, when mixed with water, would turn to obsidian before it affected their homes. The challenge was a fantastic success, with all homes surviving and participants happy with their designs. Later, we finished up with some survival mode challenges where students worked together to craft what they needed to survive mobs of monsters. Thanks to parents, participants, and leaders for making our workshops awesome! We hope to see you at our April and summer vacation camps soon!